It's hard to imagine after working on 35 turkey recipes that I'd be in the mood for another one, but behold the kimchi turkey patty melt! The mammoth recipe development project I've just completed included turkey burgers and I was left with quite a few extra patties. This recipe was actually something my client didn't pick from my master list of concepts but intrigued me enough to make it anyway. A few months ago I stopped off at Fenton's in Vacaville and ordered a patty melt. I had forgotten how much I love the combination of rye toast, caramelized onions, melted swiss cheese and a thin beef patty. All the ingredients come together in a rich, gooey, toasty and meaty sandwich that really satisfies. 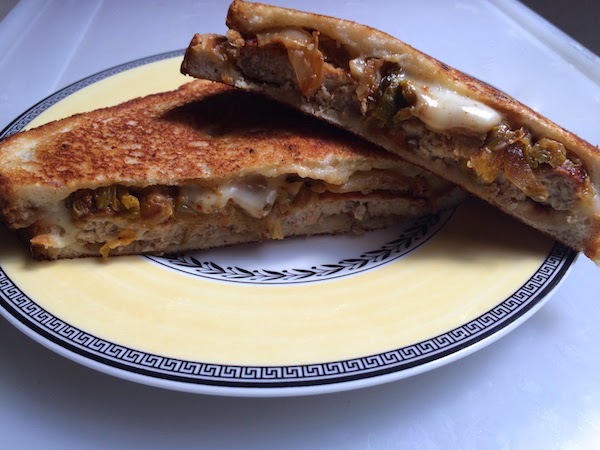 The classic diner patty melt was the inspiration for my kimchi melt, which also uses a fully cooked thin patty as opposed to a big thick burger, but replaces the onions with kimchi and the swiss cheese with pepper jack and finally the rye bread with sourdough. I like thick and juicy rare burgers from beef, buffalo or lamb, but you can't cook turkey rare so a thin patty makes sense. The mild flavor pairs particularly well with spicy and tangy ingredients which is why I sautéed some kimchi and layered on slices of Monterey pepper jack. A half cup of kimchi might sound like a lot for one sandwich, but it shrinks considerably when you cook it. Cook the turkey burger on a grill or hot skillet. Meanwhile slice the kimchi into strips and sauté in a nonstick skillet with a 1/4 teaspoon of butter for two minutes or until reduced by about half. When the kimchi is ready, butter the outside of two slices of bread. Spread each slice of bread with mayonnaise. Layer one slice of bread in a hot non-stick skillet with about 1/4 teaspoon oil. Top the bread with cheese, the burger and kimchi and place the second slice of bread on top, butter side up. Toast the sandwich in the pan over medium heat with a small lid placed on top of the sandwich to weigh it down slightly and to help melt the cheese. When the bread is toasty, about 2 minutes, flip the sandwich and cook on the second side.